She’s no Roomba, but robot number four is done! I started this robot almost 2 months ago. I made up the head with the button top & bias tape ears right away. I was so pleased… and then I got stuck. I started at least 3 different body shapes in felt and I just wasn’t feeling it. So I decided to mix it up and try for a more quilted thing with different fabrics for the body. It’s much easier to work with the wool felt but it was fun to get some polka dot action in there (thanks Leah for the fabric!) I hope that my unauthorized departure from felt goes over ok with my robot swap partner. update: hooray! she loves it. trade on. I’m so excited! i love your new robot! she looks like she’s very good at baking apple pies — not sure why. love the new directions you’ve taken. Looks like Rosie from the Jetsons! Cute! She’s adorable! The details make her quite intriging. You are inspirational. So, so cute. So very cute. Love the robot. Technical and cuddly at the same time. Nana Robot! I love her! I love the hand-stitching, and all the sweet details. Fabulous as always! love it! green is my color, so i am naturally drawn to this character…your work is fantastic…so glad i’ve found this site! i love peeking in at your vintage finds and craft projects. such inspiration! she is great! Reminds me of Rosie from the Jetsons! Hillary, You’re killing me here! This is just about the most adorable thing I’ve seen yet. Well except for Miss Daisy of course! You are just so awesome and your handiwork is flawless! I Love Love Love her. I stumbled upon my stats last night and saw a zillion hits from wee*wonderfuls and I was like, “Wha?” so I clicked over and discovered MissRoboto and your kind link to me. Thank you, Thank you for the props. How fun this has been! She is really really beautiful. I love all the little details!! WOW, Hillary! She is FANTASTIC!!! I’m in love with the greens, the cylandrical head and embelleshments. Beautiful work! awesome robot, just love the green! She is so cute! I love it. She would make an awesome pin cushion. 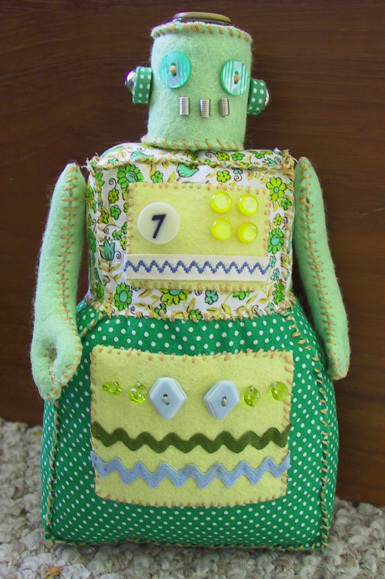 Never thought I’d see a homely, apron-wearing, motherly robot. 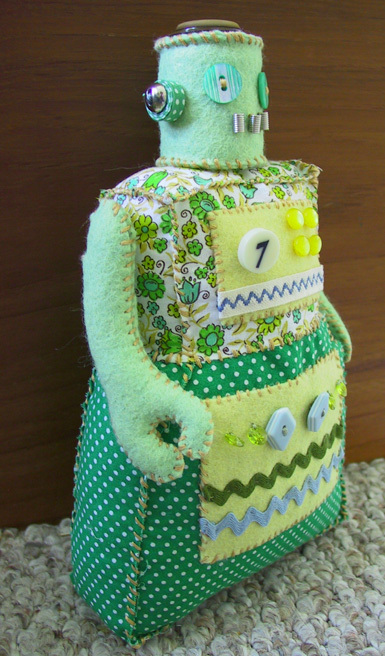 She (has to be she) is fantastic and I love the details – including your amazingly neat sewing. she’s really beautiful. Your work it´s really inspiring. Oh, she’s beautiful! The ears are perfect. And I must say she cuts a dash in this season’s essential shades of green!